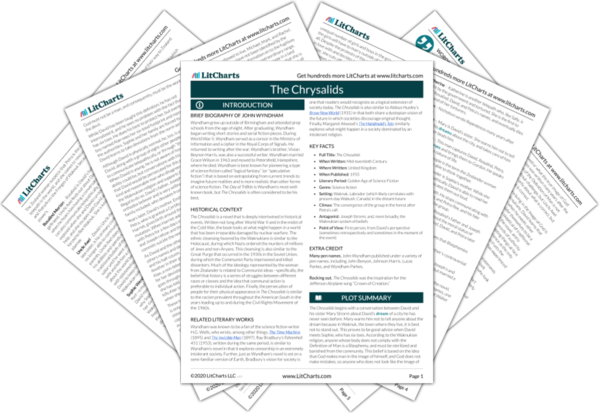 Welcome to the LitCharts study guide on John Wyndham's The Chrysalids. Created by the original team behind SparkNotes, LitCharts are the world's best literature guides. A concise biography of John Wyndham plus historical and literary context for The Chrysalids. A quick-reference summary: The Chrysalids on a single page. In-depth summary and analysis of every chapter of The Chrysalids. Visual theme-tracking, too. Explanations, analysis, and visualizations of The Chrysalids's themes. The Chrysalids's important quotes, sortable by theme, character, or chapter. Description, analysis, and timelines for The Chrysalids's characters. Explanations of The Chrysalids's symbols, and tracking of where they appear. An interactive data visualization of The Chrysalids's plot and themes. Wyndham grew up outside of Birmingham and attended prep schools from the age of eight. After graduating, Wyndham began writing short stories and serial fiction pieces. During World War II, Wyndham served as a censor in the Ministry of Information and a cipher in the Royal Corps of Signals. He returned to writing after the war. Wyndham’s brother, Vivian Beynon Harris, was also a successful writer. Wyndham married Grace Wilson in 1963 and moved to Petersfield, Hampshire, where he died. Wyndham is best known for pioneering a type of science fiction called “logical fantasy” (or “speculative fiction”) that is based on extrapolating from current trends to imagine future realities and is more realistic than other forms of science fiction. The Day of Triffids is Wyndham’s most well-known book, but The Chrysalids is often considered to be his best. The Chrysalids is a novel that is deeply intertwined in historical events. Written not long after World War II and in the midst of the Cold War, the book looks at what might happen in a world that has been irreparably damaged by nuclear warfare. The ethnic cleansing favored by the Waknukians is similar to the Holocaust, during which Nazis ordered the murders of millions of Jews and non-Aryans. This cleansing is also similar to the Great Purge that occurred in the 1930s in the Soviet Union, during which the Communist Party imprisoned and killed dissenters. Much of the ideology represented by the woman from Zealander is related to Communist ideas—specifically, the belief that history is a series of struggles between different races or classes and the idea that communal action is preferable to individual action. Finally, the persecution of people for their physical appearance in The Chrysalids is similar to the racism prevalent throughout the American South in the years leading up to and during the Civil Rights Movement of the 1960s. Wyndham was known to be a fan of the science fiction writer H.G. Wells, who wrote, among other things, The Time Machine (1895) and The Invisible Man (1897). Ray Bradbury’s Fahrenheit 451 (1953), written during the same period, is similar to Wyndham’s novel in that it explores censorship in an extremely intolerant society. Further, just as Wyndham’s novel is set on a semi-familiar version of Earth, Bradbury’s vision for society is one that readers would recognize as a logical extension of society today. The Chrysalids is also similar to Aldous Huxley’s Brave New World (1931) in that both share a dystopian vision of the future in which societies discourage original thought. Finally, Margaret Atwood’s The Handmaid’s Tale similarly explores what might happen in a society dominated by an intolerant religion. Many pen names. John Wyndham published under a variety of pen names, including John Benyon, Johnson Harris, Lucas Parkes, and Wyndham Parkes. Walker, Lanier. "The Chrysalids." LitCharts. LitCharts LLC, 25 Aug 2015. Web. 20 Apr 2019. Walker, Lanier. "The Chrysalids." LitCharts LLC, August 25, 2015. Retrieved April 20, 2019. https://www.litcharts.com/lit/the-chrysalids.